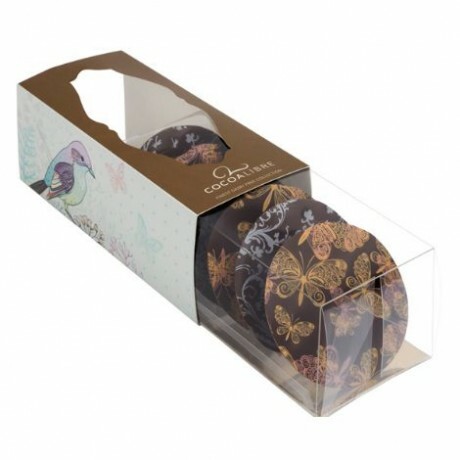 These artisan dark mint chocolate knackali are patterned with butterflies and birds. These indulgent chocolate discs have a real 'snap' to them, a smooth texture and well rounded delicious taste. Exquisite gift boxes of stunning, hand-made chocolate discs. Each pack has 6 discs (125g total). Cocoa mass, sugar, cocoa butter, emulsifier: SOYA LECITHIN, natural vanilla flavouring, E171, E172. Cocoa solids 55% min.